In this tutorial, Dubspot’s Rory PQ demonstrates how to use custom default settings to streamline your workflow and work more proficiently. 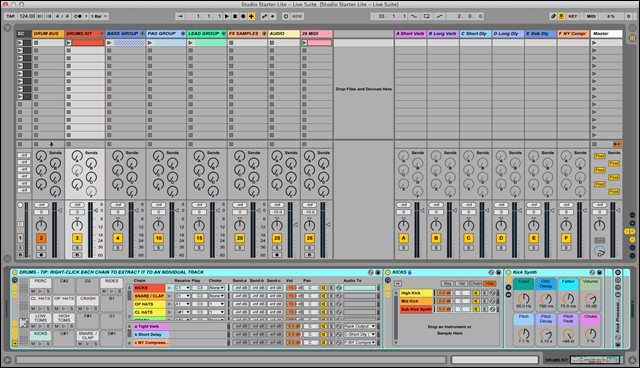 Included is a FREE Ableton Live Template project download. 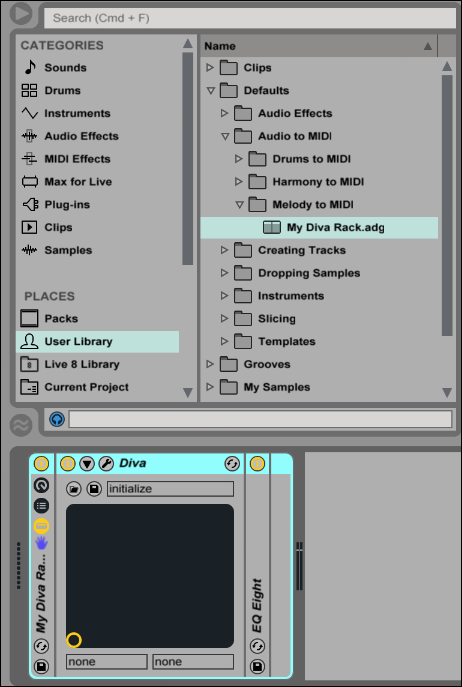 Ableton Live has quickly become one of the leading industry applications for creating and performing music on a computer. Its flexible and intuitive interface allow artists of all skill levels and styles to quickly and effectively work with music creatively. 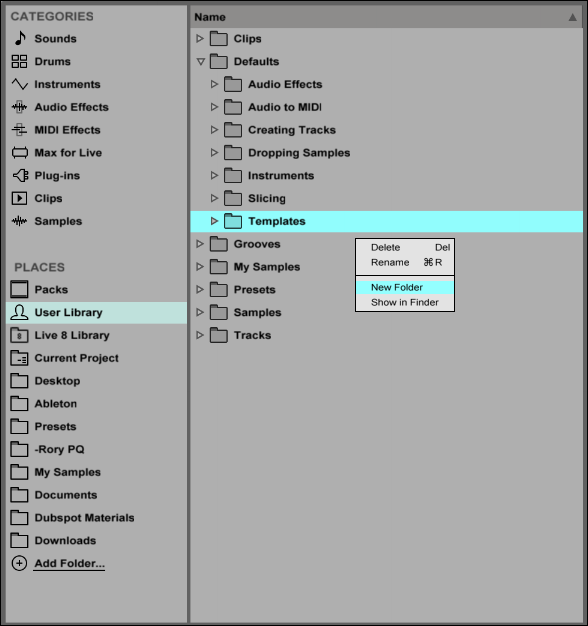 Among the many powerful and versatile features, Live also has the unique ability to be customized by creating various default presets and templates. Customizing the way you work with Live will assist you in streamlining your workflow to increase efficiency. This is huge, because workflow is just as valuable as any other music production skill. Improving your workflow is key to saving time and boosting productivity. Inspiration can spark at any given time and it’s important to lay out your ideas quickly while they are fresh in your mind and the creative Jedi Force is with you. Creating custom device defaults and project templates in advance is a great way to help you jump in and create music quickly while your creative energy is still fresh. Start every project with convenience and save time by eliminating the repetitive and tedious routines of setting up your projects and devices every time you open a new Live Set. Let’s dive into the details and thoroughly explore the advantages of creating various defaults and templates so you can customize Live to your personal workflow. Feel free to use or customize the template to fit your own personal workflow. See detailed instructions about how to use the templates further down the page. Creating a custom default Live Set is a great way to save time, stay organized, and kick-start new projects with convenience. Creative momentum is often lost after tediously setting up your project and performing repetitive tasks every time you start writing music. 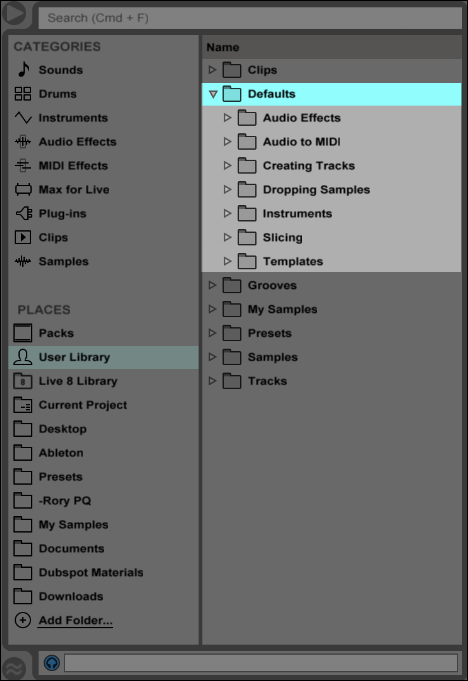 When you fire up Ableton Live and open a new project, your Live Set will automatically load everything you saved in your custom default template. This includes Audio and MIDI tracks with your favorite Live devices and third-party plugins, Bus Groups, Return tracks, In/Out settings, Mixer settings, personalized Racks and device presets, Audio and MIDI clips, Key and MIDI mappings, Macro controls, Tempo, Grooves, and interface skins. Saving a default template is fairy easy and you can always reset it back to the factory default Live Set with a click of a button. Saving a custom template as your default Live Set is simple. You can quickly reset the Live Set back to factory default by clicking the ‘Clear’ button. It is also possible to create multiple templates as well to fit the needs of specific projects. First, we need to set up a ‘Templates’ folder for saving custom Live Sets. 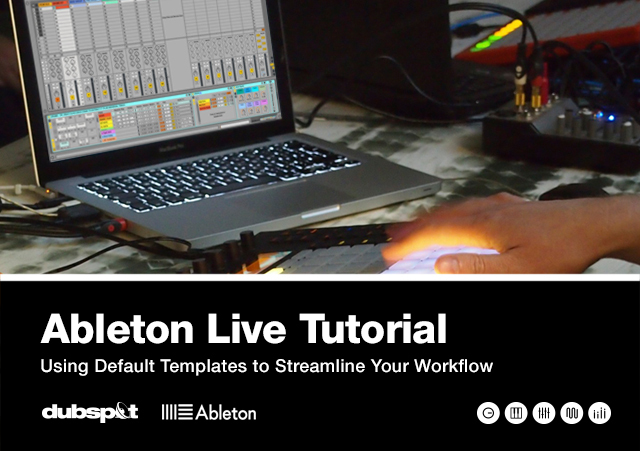 To load any of the templates, first open Live and either double-click your desired template or drag one into the current Live Set. Live is capable of saving different types of default settings. You can customize how Live responds to various user actions, such as loading personalized device presets, sample dropping, converting audio to MIDI, and slicing audio. You can even save defaults for Audio and MIDI tracks, so that they load with personalized devices and settings each time. Default presets are saved to the ‘Defaults’ folders in your User Library and they will load in place of Live’s generic device settings. 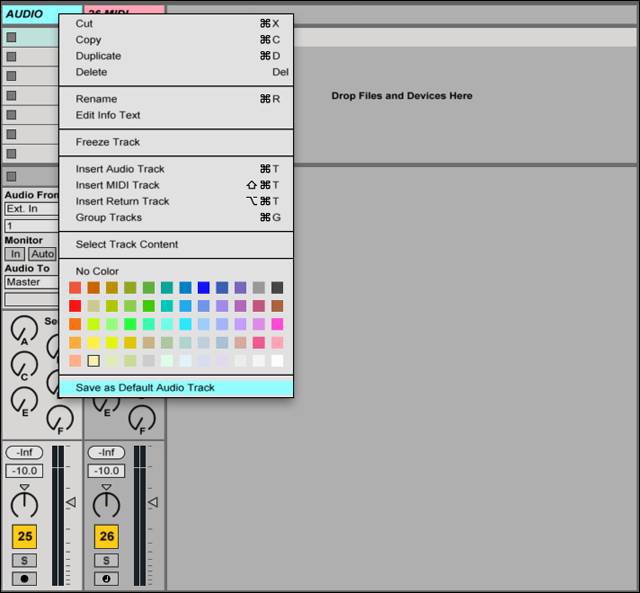 Live has the ability to create Audio and MIDI track defaults. This handy feature allows you to set up a specific set of devices and settings that load each time you create a new Audio or MIDI track. This includes you favorite Live devices and third-party plugins, personalized Racks and device presets, In/Out settings, Mixer settings, Live Clips, and colors. Creating custom Track Defaults is extremely easy. Live’s native devices can be personalized as well. Saving device default presets allow you to load any Live device with your preferred settings each time. Save time by setting up your devices to load the way you like instead of the factory settings. Save the current settings of any device as a default preset with the following steps. This works for all of Live’s Instruments, Audio Effects, and MIDI Effects. When saving a new default preset, you will be asked to overwrite the previous one. You can restore a device back to its factory default by deleting the custom preset from the corresponding device folder located under the ‘Defaults’ folder in the User Library. When loading samples to Sampler I often find myself adjusting the same parameters to my preferred settings and adding many of the same Audio Effects, which can become a very tedious process. You can personalize how Live loads audio samples when dropping them into a Drum Rack or the Device View of a MIDI track. By default, Live loads samples into a Simpler device. 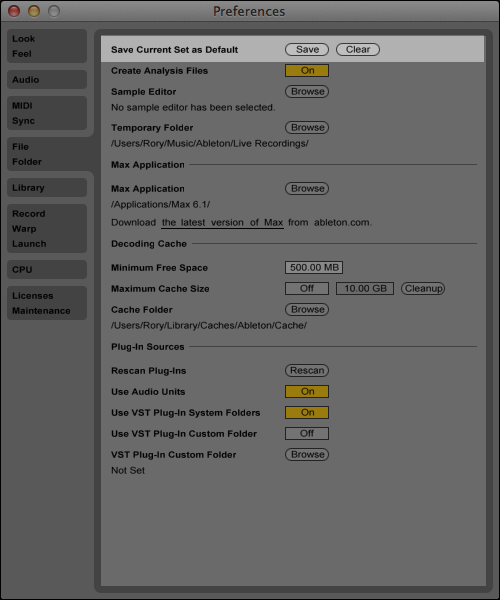 However, Live Suite users will have the option to convert Simpler to Sampler. Configuring sample dropping defaults allow you to create custom device chains with your preferred settings so you can quickly edit your samples without wasting time adding additional devices and setting up controls each time you drop in a sample. This includes Audio and MIDI Effects, third-party plugins, and personalized Racks and Macro controls. Configuring custom defaults for dropping samples is a breeze. Custom Drum Rack pad defaults can be saved as well. You can also create defaults that will load whenever you convert an audio file to MIDI. When converting audio to MIDI, Live will preload a different default Instrument Rack depending on what ‘Convert’ command you choose. Live’s default Instrument Racks work well for previewing the converted audio, however they are less than ideal for your next club banger. Creating Audio to MIDI defaults allow you to load your favorite Live Instrument presets or third-party plugins instead of the default Instrument Racks. For example, when I convert ‘Melody to MIDI’ Live will load an Instrument Rack preset with Diva by u-he and an EQ Eight instead of the less pleasant synthesizer Instrument Rack. I also have a custom Drum Rack preset for converting ‘Drums to MIDI’ with a few Audio Effects I often use, such as Saturator, EQ Eight, and Compressor. Saving ‘Drums to MIDI’ defaults. Saving ‘Melody to MIDI’ or ‘Harmony to MIDI’ defaults. Your custom presets will be used each time you use any of the ‘Convert’ commands. To return settings back to factory default, simply delete your custom Instrument Rack from the corresponding conversion folder. The finial default setting we will explore controls how Live behaves when slicing an audio file. Creating Slicing presets is extremely handy and allows you to create more complex racks for processing your new slices. I explored this thoroughly HERE in my article about Breathing New Life into Sample Loops. Live’s default Slicing presets are okay for simply slicing audio. However, they often require some additional tweaking. Why settle for okay when we can make them great by creating our own custom Slicing presets. Similar to the steps for creating a custom Drum Rack pad, we can configure a chain of effects and Macro mappings to develop many different custom Slicing presets. Unlike the other default settings we explored, you can save multiple Slicing presets. When slicing audio files, you will be able to choose which preset to use from the Slicing Options dialog box. Saving Slicing presets is as easy as the previous default settings we explored. The free ‘Studio Starter Lite’ Ableton Live template was designed to help keep your projects organized and assist in accelerating your ability to work proficiently and maintain a creative flow. Lets jump right in and take a look at what this template includes and how to integrate it into your projects. Lets begin by downloading the Studio Starter Lite project and loading the template in Ableton Live. Optionally, you can save the Live Set as your default template so that Live opens it every time you start a new project with the following steps. 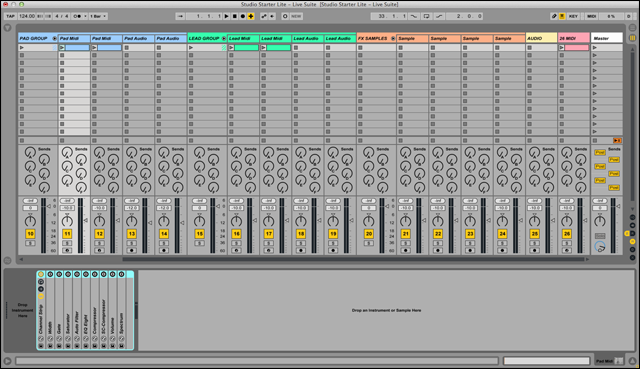 Compatibility: This template will work with Mac or PC running Ableton Live 9 or higher. The dedicated Sidechain track comes loaded with a custom SC Adjustable Note Rack. This Instrument Rack comes pre-loaded with a kick sample for triggering sidechain compression and Macro controls for adjusting the Note Length and Note Rate of the sidechain source. Automating these controls are great for adding additional movement to sounds and creating pumping buildups that increase in rate. Every Compressor in this template that is set up to sidechain is routed to the Sidechain track as the input source. At first glance the Drums Kit track looks a bit complex, but I assure you it is extremely easy to grasp. The feature rich Drum Rack is designed to layer drum sounds and build beats quick and easy. 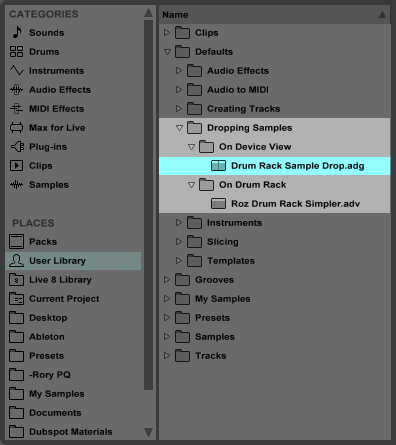 The Drum Rack contains multi-layered pads stacked with additional Instrument Racks for various drum sounds. 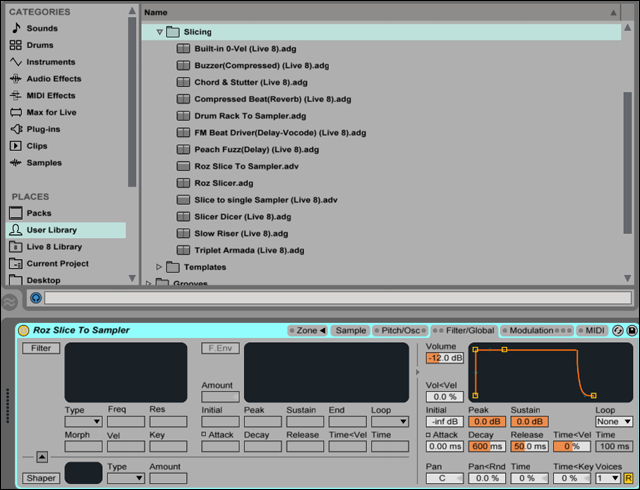 The Live Suite version of the template uses Sampler instead of Simpler for creating 128’s, a technique used to quickly select drum sounds on the fly. In addition, the Drum Rack is set up with its own dedicated Return chains for processing individual sounds. Also, you can easily populate the remaining empty pads with additional sounds by copying any of the racks from exciting pads to any empty pad. Many artists may prefer to design their drums on separate tracks rather then using a single clip for programing beats. Fortunately, Live is extremely versatile allowing us to take advantage of both methods. This template is set up to quickly program beats in a single MIDI clip. However, Live has a great feature that is capable of extracting each drum sound out to its own individual track with its own MIDI clip. Extracting chains from a Drum Rack is a fairly easy process. Lets kick things off and explore the Kicks chain first… pun intended! Expand the Drums Track to reveal all the drum chains. Select the Kicks chain to show the Instrument Rack in the Device Viewer. For this demonstration I will be using the Live Suite version of the template, which uses Sampler instead of Simpler, and Operator for creating Sub Kicks. Looking at the Chain List you will see three chains for created layered kicks. Layering samples is an effective technique that allows you to create your own unique sounds. It gives you more control to shape an ideal sound that works with your track. Each chain focuses on a different frequency band so you can control the low sub, mid punch, and top click of your kicks. This technique can be applied to any other drum element as well. The Sub Kick Synth chain is loaded with an Operator and some additional Audio Effects optimized for creating and processing a sub kick. Shaping the sound of the sub kick is quick and easy. All the controls for fine-tuning the sound are mapped to Macro controls. The Mid and High Kick chains contain an identical Instrument Rack loaded with Sampler and an EQ Eight. All the appropriate controls for fine–tuning your samples have been mapped to Macros allowing you to quickly shape your sound. The Live Suite version of the template uses Sampler and the Live Standard version uses Simpler. Why two version, what’s the difference? Well, Sampler does not come bundled in Live Standard. It is only included in Live Suite, or can be purchased as an additional instrument. In addition, Sampler is more advanced then Simpler. This extremely versatile instrument is capable of combining traditional sampling features with advanced sound design and synthesis. This template takes full advantage of Samper’s multi-sample capabilities and is set up to use a technique called 128’s. Ok, what is 128’s? Sampler is a multi-sampling instrument that can store up to 128 samples. 128’s is an incredible time saving technique used to quickly select samples on the fly without having to dig through your User Library. Creating your own 128’s with Sampler in this template is easy. The Macro controls for selecting samples are already set up. You just need to add your own audio files by following the steps below. Note: It is possible to use the 128’s technique with Simpler in the Live Standard version as well. However, the set up process is a bit more involved. Simpler is not capable of storing multiple samples that can be selected individually. Alternatively, you can load up to 128 instances of Simpler on a single chain. This process is more involved because you can’t simply drag in all your audio files at the same time. You would need to load individual files to each Simpler separately. The Live Standard version is already set up to do this, you would just need to drop in additional Simpler devices or duplicate the existing ones. For more detailed information about creating 128’s, check out this great tutorial HERE. 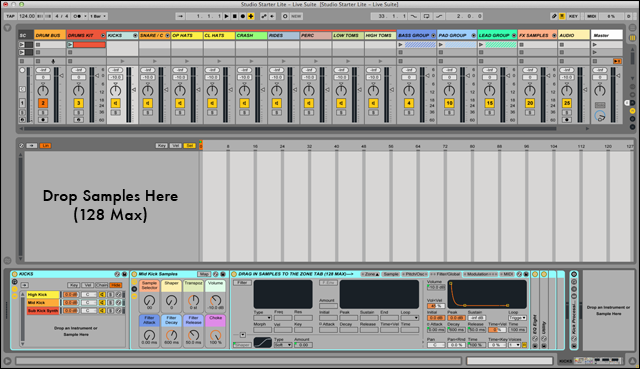 Dubspot Instructor and sound programmer-extraordinaire Chris Petti shows you how to create a Drum Rack that will possibly be The Last Drum Rack You’ll Ever Have to Make in Ableton Live! The remaining drum chains are each loaded with the identical Rack as the two Kick Sample chains. To get started, click on the drum element you wish to edit in the Chain List and drop your samples into Sampler’s Sample List View. Quickly select your desired sample using the Sample Sector Macro and fine-tune the sound with the remaining Macro controls. Audio Effects: Additional Audio Effects Racks loaded with common mixing devices have been added to the end of each device chain for further processing the sound. The devices loaded in each Rack vary depending on the drum sound. Return Chains: Live’s Drum Rack has its own dedicated Return section, which allows you to send individual drum elements to different Audio Effects. Below the Chains List are three Return chains for adding space and punch to individual drum sounds. The Send sliders located in the Drum Racks Chain List allow you to adjust the amount of signal sent from each drum chain to any of the available Return chains. Choke Groups: The Open and Closed Hat chains have been assigned the same Choke Group to simulate a real drum kit. The Open Hats will silence the Closed Hats or vice versa when played at the same time. Drum Bus: The output signal of the Drums Kit track has been routed to the Drums Bus track for group processing. Bus processing is a great technique used to gel a group of instruments together and process the combined sounds as a whole further to enhance presence, clarity and punch. Sub Bass: For Live Suite users, the Sub Bass track comes loaded with a Sub Bass Rack containing an Operator optimized for creating deep bottom end sub bass. Live Standard users will find a Simpler loaded with a sub bass sample recorded from Operator. Each Rack has the appropriate controls mapped to Macros for fine–tuning a sub bass sound quick and easy. Multiband Freq Splitter: The Multiband Frequency Splitter Rack is designed to separate the signal so you can apply individual effects to the Low, Mid and High frequency bands. The appropriated controls for adjusting the frequency bands are mapped to Macros. Develop the Rack further by adding your own chain of Audio Effects to each band for more complex signal processing. Return Track ‘A’ has a custom Short Reverb Rack set up with a short decay time and smaller room size. Room reverb is great to simulate the natural sound of an acoustic space in the mix. Return Track ‘B’ has a custom Long Reverb Rack for adding depth and dimension. Longer reverb is great for pushing sounds back to create depth and creating ambiance to fill gaps in the mix. Return Track ‘C’ has a custom Short Delay Rack with some EQing to help the delays fit in the mix better and a Utility to add some stereo width. A Sidechain Compressor is set to sidechain from itself to help clean up overlapping delays and phasing issues. Return Track ‘D’ has a custom Long Delay Rack for an extended delay effect. Saturation and panning devices are added to produce a warmer analog type delay. A Sidechain Compressor has been added to help clean up the delays from cluttering the mix. Return Track ‘E’ has a custom Dub Delay Rack for long feedback-style dub delays. This is good for transitions, breakdowns, and sound textures. Return Track ‘F’ has a custom New York Compression Rack to add dynamics for a thick and punchy sound. It works great for drum elements. The Master Channel has a Utility set to Mono and an Audition Mastering Toggle Rack stacked with some common devices used to reference your track during the mixing and mastering stage. These two tools are meant to reference your track throughout the mixdown process. Its recommended to keep them deactivated while working on Sound Design and Arrangement. The following keyboard mappings are set to quickly enable and disable different controls. 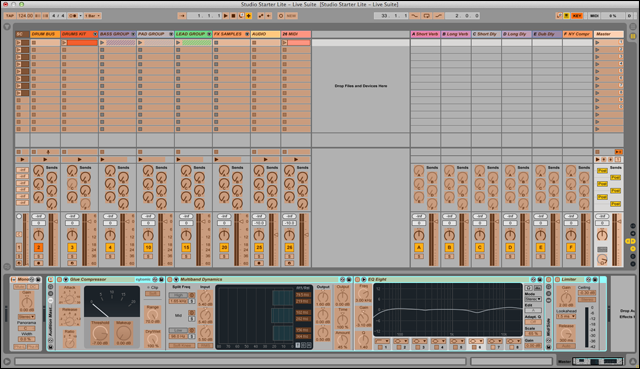 That concludes our journey through Ableton Live’s Defaults and Template Set instructions. Hopefully some of these tips and techniques will assist in streamlining your workflow and help you to work more proficiently. Please share your thoughts or offer feedback about the Studio Starter Lite Template below in the comments. Your ideas will help greatly to improve the template further!